Thanksgiving is a great excuse for breaking out the homemade rolls. There is plenty of time to let them rise. Of course you have an excuse to eat them. It’s Thanksgiving after all. They go very well with turkey, stuffing, cranberries… No more reasons needed. They’re clearly a must this week. I love the smell of homemade yeast rolls. I admit that I pull one off and immediately give it an inhale to sniff the smelly, yeasty goodness. It reminds me of warm kitchens and holidays filled with laughter. Even when I make these rolls at other times of the year, I think holidays and smile. 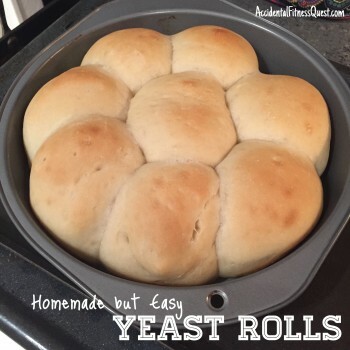 Making homemade rolls really isn’t that difficult. It takes a bit of time, but most of the time you aren’t actually doing anything. You plan ahead and then let the rolls do their thing while you’re busy doing other stuff. It’s well worth the time to get fluffy, soft, yeasty rolls. I made these to go with Thanksgiving Dinner at the Quest House. Obviously they are great to have with dinner, but they also make perfect mini sandwiches with the leftover turkey, stuffing and cranberries. Thanksgiving sliders on homemade rolls! You’d be crazy not to love that idea. By the way, I make homemade cranberry sauce every year and change things up with different variations. This year we went with tequila lime cranberries! Mix the water, almond milk, and sugar in a small bowl. Heat for about 30 seconds in the microwave until just a bit warm. You don’t want it too hot or it will kill the yeast. Stir in the yeast and mix well. Set it aside for about 5 minutes until the yeast activates and it gets foamy. In a large bowl, measure the flour, salt, and butter. When the yeast is ready, stir in the yeast mixture and begin to combine it. When it’s almost mixed in, use your hand or a hook attachment on your mixer to knead the dough for about 4-5 minutes until it forms a smooth ball. The dough hook makes this process SO much easier. Place the dough ball in a bowl sprayed with non-stick spray. Cover with plastic wrap and let it rise in a warm area until doubled in size, about 1 hour. When the dough has risen, punch it down and press it out on a lightly floured surface. Spray a 9 inch pie dish or cake pan with non-stick spray. Divide the dough into 8 pieces. I pressed it out into a square first, then cut the square into quarters and each quarter in half. Roll each piece into a ball and place in the prepared dish. Cover the dish with plastic wrap. If you’re making the rolls right away, let them rise for another 45 minutes or so until they double in size. If you’re making them later, place the covered pan in the fridge up to overnight. Bring the rolls out about an hour before you’re ready to make them for the last rising. Preheat your oven to 375 degrees. When the rolls have finished the second rise, remove the plastic wrap and baked at 375 for 15-20 minutes until browned on the top. Remove from oven. Make 8 rolls at approximately 133 calories each – 4g protein, 27g carbs, and 1g fat. Because The Kid has a dairy allergy, I used almond milk and dairy free butter in this recipe. Smart Balance and Earth Balance both make dairy free butter flavored spreads. I’ve never made this recipe using real milk and dairy butter, but I don’t see a reason why it wouldn’t work. If you give the dairy version a try, please let me know how it turns out.